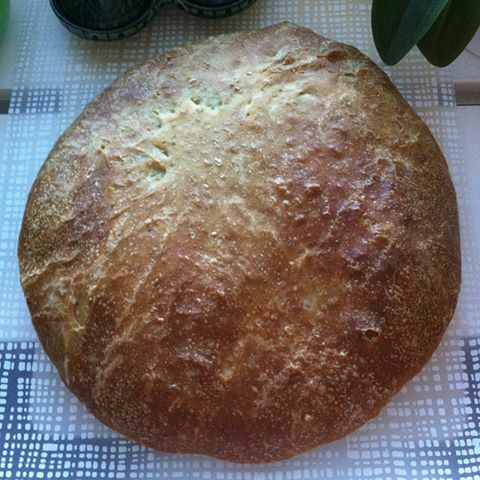 It is not difficult, hard or expensive to bake their own bread. Fresher than you bake yourself , you do not get . Without a lot of additives or other things that many bakeries to put their bread, especially the ones you buy in the grocery store . And actually it’s not a job at all, if you do as I do and hardly any dish after . I use an old friend , breadbaking mashine, that I bought used at a garage sale a long time ago . Cost me almost nothing . Then just pick out the bread from the fridge. Remove the towel. Let it stand at room temperature. Into the oven. Bake . Clear. Put everything in a bread maker and run on mixing and fermentation. Alternatively, mix everything yourself and work the dough about 20 minutes and let rise for 40 minutes. Turn the dough onto a baking sheet with parchment paper. Cover with a damp towel . Into the fridge overnight . In the morning, remove the plate , remove the towel and allow to stand 10-15 minutes at room temperature. Bake 200c for about 15-20 minutes or until golden. Remove and let cool for a towel. I love the smell of baking and it’s soo good when it’s bread! !